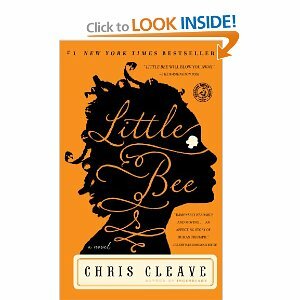 The Purple Caravan: "Little Bee", a novel by Chris Cleave. I suppose we all have our own personal ways to chose the books we read. Older books call me, not necessarily "classics" but just older, off the beaten path. This preference of mine could make me feel quite lonely in the sense that no one I know has heard about any of the writers I mention. I am constantly prowling flea markets, garage sales, and charity shops in search of something that catches my eye. I first look at the cover (yes, I know, one should never judge a book by it's cover, but who really listens to good advise?) then open the first page and read the first few words. I'd know right there and then whether or not I'll take it home with me. It's almost like love at first sight, a connection, a chemistry. In my searches I also find that in addition to the cover and the first few words, the size of the book plays a role. I absolutely love small books that are easy to carry and rest on my chest and "still my heart." A couple of days ago I visited our local library and just as I was passing the "newer book section" I spotted "Little Bee." The bright yellow cover caught my eye and so did the very first words. It seems almost appropriate that chance made me pick this book at precisely this time of the year when we are getting ready to sit at the table with loved ones and give thanks for all we have, and try and forget all that we don't have. I hope to hold on to the message I found in "Little Bee" not only on Thanksgiving Day, but everyday. La verdad que es fantástco cuando de pronto se coincide con un libro; con lo que cuenta. Voy a fiarme de tí, y tratar de encontrarlo, necesito una inyección literaria que me reconforte éstos días ... ( he visto que va a ser llevada al cine, con Nicole Kidman de "prota") Trataré de buscarla a ver si está traducida aquí. Hola Femme, Ojala lo encuentres y que te guste tanto como a mi. No sabia que iban a llevar la historia al cine! Sin duda Nicole Kidman estara perfecta para el rol principal.